Posted September 20, 2017 by laurielmorrison & filed under Every Shiny Thing, Middle Grade Literature, The Writing Process. Lately, I’ve been thinking a lot about the portrayal of parents in middle grade novels. There are all sorts of challenges when it comes to creating parent characters in books for kids. For instance, how do you get the parents out of the way so that your middle-school-aged characters can get themselves into enough trouble that you have a story? How do you even refer to them if you’re writing in the third person (Mom? Mr. So-and-So? Patsy?)? But I’m especially interested in the challenge of how to create nuanced, sympathetic parent characters in books that are told from a kid’s perspective…when, and I hope I’m not shocking anyone here…kids don’t always see their parents in nuanced, sympathetic ways. Paterson’s article “People I Have Known” appears in this anthology, which is full of lovely, insightful speeches and essays. I love this quote because, well, it’s from Katherine Paterson, and she’s amazing, but also, I think it captures something amazing about the power of books. Readers can be so completely inside a character’s mindset that they understand, empathize with, and even adopt that character’s impressions of other people and interactions. BUT books can also leave room for readers to see a bit beyond the point-of-view character’s perspective and take, as Paterson put it, a “more objective look.” Sometimes it might take a conversation with someone else (a teacher, a fellow reader, Katherine Paterson herself if you’re really lucky) to think about secondary characters more objectively, but sometimes readers will do that on their own. 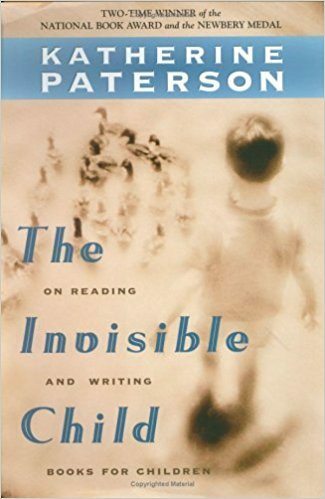 As Paterson suggests, that more objective look can allow readers to recognize things the main character is not able to appreciate…and perhaps that experience of seeing through a character’s point of view and around the edges of it can allow a reader to broaden his or her own point of view and think about other people (possibly even parents!) in more compassionate ways. But Paterson also makes it clear that, while a “wise reader” will recognize the limitations of her characters’ points of view, she would rather have readers accept their views as completely correct than weaken her stories to give other characters a better chance at being likable. It’s okay with her, in other words, if readers end up thinking of Jess Aarons’s parents as mean. But what if you’re trying to write a book that won’t quite work if readers don’t sense that a character’s take on her parents (or other characters) is not the whole story? That’s the case with Cordelia Jensen and my forthcoming middle grade novel, Every Shiny Thing. It’s not a spoiler to tell you that the narrator of my sections of the book, Lauren, is so hurt, angry, and afraid that she misunderstands her parents’ motivations and sees them in a negative light that they don’t completely deserve. Even though I, as the adult creator of these people, could see around the edges of Lauren’s point of view and sympathize with her parents, it was very difficult for me to spot moments where I could show the nuances of their emotions and reactions. As I got into Lauren’s character, my blinders were just as narrowing as hers were. It’s a tricky business, portraying parents in a realistic way without breaking out of an authentic point of view or letting them take over the story, especially when it’s important to a book that parents don’t come across as just plain mean (though as Katherine Paterson suggests, sometimes that’s not important). I’d love to hear about some middle grade novels other people love that manage to hint at the trying circumstances parents are dealing with, even when the main character isn’t always conscious of the parents’ struggles!